In 1962, Roger Morgan is the boy wonder restaurateur spearheading the Seattle World’s Fair known as the Century 21 Exhibition, the event that gave rise to the Space Needle. In 2001, Roger decides to cash in on the decades of good will he’s built up as the city’s primary booster by launching a surprise campaign for mayor. In 1962, he tries to comprehend and contain municipal corruption that threatens to tarnish the Fair’s image. In 2001, he strains to convince himself and the electorate that he has no skeletons in his closet. In ’62, he has only his own demons for company. In the new millennium, he’s dogged by an ambitious but not unsympathetic reporter. 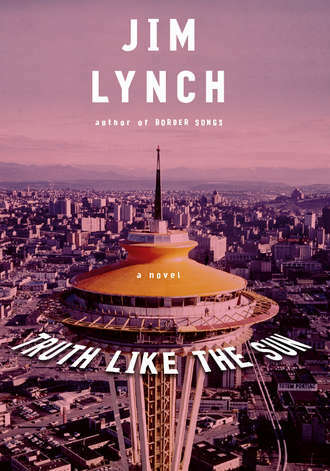 Truth Like The Sun is steeped in Seattle history, but it’s also the story of any city struggling to define itself. I’m tempted to call it an upbeat version of The Wire or a West Coast Bonfire of the Vanities, but I know Seattle chafes at being compared to other places. And Lynch has succeeded on his own terms, writing a terrific novel of urban life.